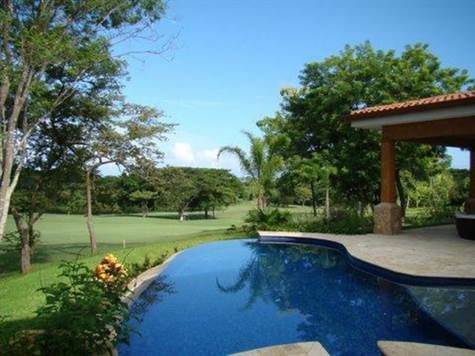 Casa Tres Manos is located in the exclusive gated community of Reserva Conchal, Costa Rica. This private luxury home has it all with over 5,500 square feet, and7,000 square feet under roof - it is Reserva Conchal's largest private residence! The home comes fully furnished, is beautifully and tastefully decorated, sleeps 12 and makes for a great vacation rental. The main floor consists of a large two-story entry way, main-floor master with double walk in closets and luxurious master bath, comfortable great room, study, dining room that seats 12, large gourmet kitchen and breakfast nook, huge walk in lock off pantry that also houses an additional refrigerator/freezer, half bath, oversized laundry room with front-load washer/dryer. The upper floor has four additional bedrooms. The extensive terrace allows for full enjoyment of our beautiful Costa Rica evenings. The large outdoor covered sitting area features a six-person spa, infinity pool overlooking the pristine Robert Trent Jones championship golf course and is complete with grilling area and outdoor bath.